Successfully Added Wireless Doorbell with Surveillance Camera and Video Recording to your Shopping Cart. No matter where you are in the house, this Wireless Doorbell Camera will let you know when someone is at the door. It also keeps track of visitors and guests with a hidden surveillance camera that provides high quality video and audio recording. Extremely simple and easy to use, this Wireless Doorbell Camera requires no setup or extra installation. Simply insert 2 AAA batteries and the doorbell is pressed, the transmitter will send a colorful and musical tone to the receiver unit that lets you know when someone is at the door. The receivers can be placed up to 30 meters away, so even if you're cooking in the kitchen, blasting music in your room, or taking a shower, you'll be able to hear the musical alert. The delivery man can only wait so long! 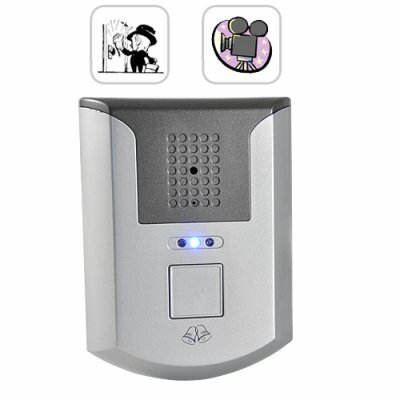 This Wireless Doorbell Camera also includes high quality 1280 x 960 video recording at 30 FPS along with a built-in microphone for audio recording. Whenever the doorbell is pressed, the camera will start recording a 30 second file onto a TF / micro SD card (up to 8GB) so you can keep a video log of who's been coming and see if there are any unwanted or unexpected guests. This cool tech gadget is highly useful and comes at an unbeatable price. Available in our warehouse now, order today and we'll express ship it out tomorrow. Brought to you by the leader in wholesale electronics - Chinavasion. Does the CVQX-DC22 also record audio?